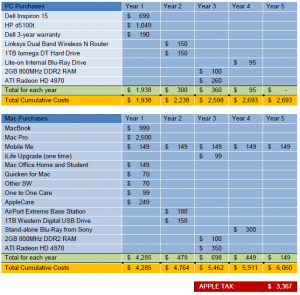 A recently released white paper titled “What Price Cool?“, sponsored by Microsoft, has provided the proof that Apple Mac’s do in fact cost more to own and maintain when compared to PC’s of the same specification. Throughout the white paper it discusses the “Apple’s premium priced product[s]” and how comparing Mac vs. PC “makes it clear that Mac buyers are paying a lot for cool”. Along with reporting on the aforementioned white paper, The Windows Experience Blog created a mock-up tax return for a typical family’s Apple Tax, which according to the data presented in the white paper, is a massive $3,367. While that figure may seem unreasonable, the costs are obtained from a table (quoted below) within the white paper, showing a balance sheet over the period of 5 years and the costs associated with upgrading software and general expansion. Many have disputed the results stating many aspects of cost, such as software, were only applied to the sample Mac purchase but not the PC purchase. Regardless of this detail, the price difference would only be minutley less (~$300) than originally stated by the white paper. The white paper concludes these figures by simply expressing the Apple Tax as a graph, of which the substantial premium “is even clearer as a visual”. 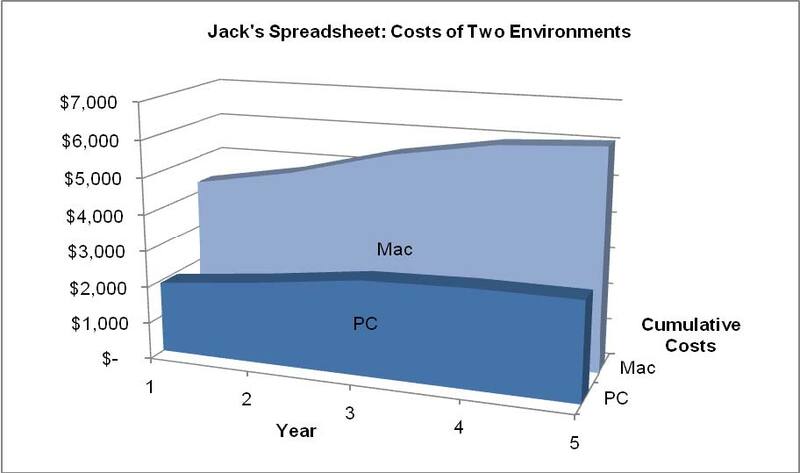 Along with the financial comparison, the white paper also discusses some of the other differences when comparing the Mac vs. PC and why Mac’s are still considered ‘cooler’ than PC. So, why, again, was the Mac so much cooler? Oh, the CEO was a better public speaker. And? Uh, the system never crashes. Right, Windows has that, and? The plastics are prettier. Have you seen the XPS One? The Mac boots right up. That right? Shall we benchmark? With Windows, you get a vast ecosystem that produces form factors from the Acer Aspire One netbook to the Dell XPS One all-in-one to the HP Firebird low-profile gaming system to the high performance Velocity Micro Signature Edition. While some of the prices quoted by the white paper may be challened, the essense of the white paper still remains. 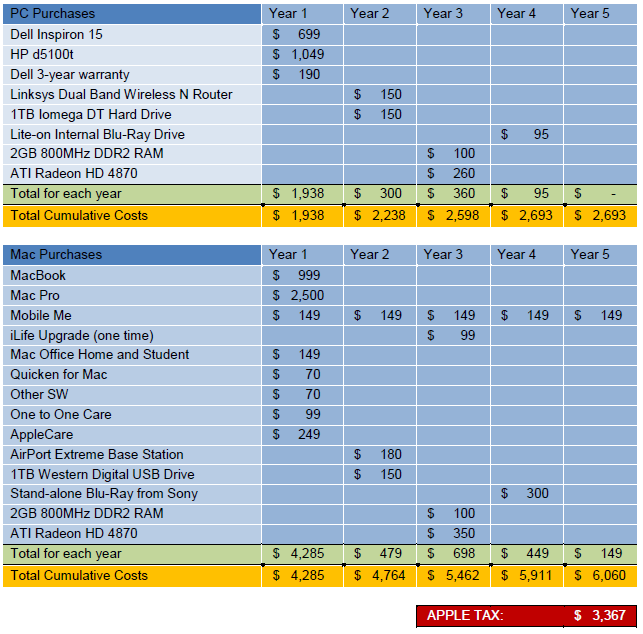 The estimated Apple Tax, dismantled pro-Mac arguments, coupled with the recent release of the ‘Laptop Hunter‘ advertisements collectively mounts and supports most of the main points when comparing Mac’s vs. PC, that you do in-fact pay for a brand and something that’s out of date tomorrow and stuck in the past.